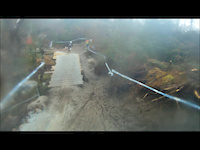 Head cam of the 2010 iXS European Downhill Cup track held in Ilmenau. Rider: Alasdair MacLennan. MTBcut team rider Joe Barnes rides one of the most technical trails you can find! Take a walk down the Mont St Anne track and have a lol with Adam Brayton and Rich Thomas and Co. Follow Jack Reading and his riding friend William Jones as they hit up the trails surrounding Malaga, Spain.